The rise of Starbucks in China, like that in the west, is closely linked to its function as a “third space” for people to hang out between home and work. In recent years, a bevy of coffee entrepreneurs are trying to topple the American giant’s dominance in China and lately, an unexpected contender — WeWork — has joined their camp. This month, the office tenant and workplace service provider launched WeWork Go, a new feature that allows China-based users to rent a desk by the minute so they are no longer tied to long-term leases. While Starbucks provides free accommodation and charges for coffee, WeWork flips the equation to offer free coffee and paid space. Starbucks is already being squeeze in China by emerging rival Luckin Coffee, a well-funded startup that explicitly pledges to take on the Seattle-based giant with a model that focuses on coffee delivery. WeWork Go works a bit like other shared services, with an app that lets users check the occupancy of a list of offices in real time before they travel over. Upon arrival, users scan a QR code at the gate, pop the door open, get seated in the common area and the billing begins. The firm says it monitors traffic flow closely so the common space isn’t flooded with fleeting users. Booking private rooms require additional fees. 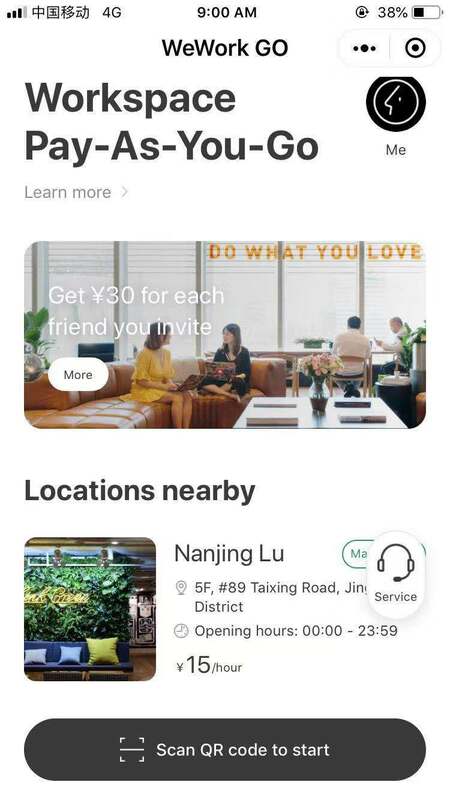 Go claims to have picked up 50,000 registered users so far after piloting for three months across an inventory of 18 locations in Shanghai, where WeWork nestles its China headquarters. Instead of building a native app, WeWork Go operates via a WeChat mini program, a form of a stripped-down app that works within China’s largest social network. Mini programs are an increasingly popular way for startups to trial ideas thanks to their relative ease to develop. “[Go] is a key development of our China localization,” a WeWork spokesperson told TechCrunch. Go is tailoring to the so-called “part-time users.” “These people would not purchase the monthly membership. They would work at home or a coffee shop, restaurant, or library,” Dominic Penaloza, who heads innovation and technology at WeWork China, told TechCrunch. He first conceptualized the on-demand workplace service at Naked Hub, a smaller local rival WeWork China bought out for $400 million last year. After the merger, the executive alongside his tech team joined WeWork and continued with the project that would later become Go. The pay-as-you-go feature is also getting rolled out stateside at a new Manhattan location last week. Penaloza admits Go could be competing with coffee shops for it offers “an alternative type of the third space for freelancers, mobile workers, business travellers or those who want to briefly step aside from their offices for a mental break.” The obvious target is Starbucks, which commands a whopping 51 percent share of the country’s booming coffee market. For WeWork, Go serves as a trial for those deciding whether to sign on monthly subscriptions. What they are weighing is the 1,830 yuan ($271) price tag for a hotdesk in downtown Shanghai. By comparison, Go starts at 15 yuan and goes up to 30 yuan an hour at more prime locations, offering the same perks as the full-time hotdesking plan, which includes access to common spaces, beverages and wifi. Users can do their math. “If you started as a WeWork Go member, and if you use our service quite a lot, you will realize it’s much more economical to purchase monthly subscriptions. WeWork Go enables WeWork to reach an entirely new market segment,” suggests Penaloza. The flexible pricing may help WeWork — which generates the bulk of its revenues from large corporations — reach a wider user base. The shared office industry in China has entered what real-estate researcher Jones Lang LaSalle calls the “second phase,” with big firms moving into premium workplaces like WeWork and local player Soho 3Q. Cash-strapped startups, on the other hand, increasingly turn to government-backed incubators for lower costs. Several early users of Go told TechCrunch they found the service delivering a “quieter” and “more comfortable” vibe than most cafes, but distance is key when they are in a rush. WeWork currently has about 60 locations across a dozen major Chinese cities, whereas Starbucks reaches a dense network of 3,330 stores and is shooting for 6,000 by the end of 2022. WeWork China got a boost for locations with the Naked Hub acquisition last year and says it’s open to adding third-party spaces such as restaurants into its inventory, though it has not taken a solid step towards that vision.